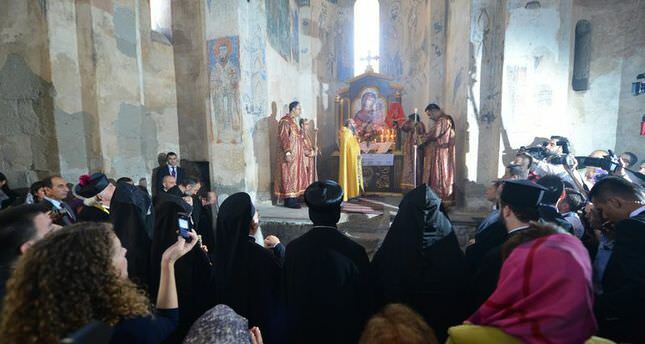 A special religious service held in a historic church in eastern Turkey brought together top figures of Orthodox churches on Sunday. Akdamar Church, located on an island in Lake Van, hosted a religious service presided by the Vicar of Turkey's Armenian Orthodox Church Aram Ateşyan. Fener Greek Orthodox Patriarch Bartholomew I, Patriarchal Vicar of the Assyrian Orthodox Church Yusuf Çetin and Diocese of the Armenian Church of America Archbishop Khajag Barsamian attended the mass. It is the first time that leaders of Orthodox churches in Turkey attend a mass together. A large crowd of the Orthodox faithful both from Turkey and abroad were also present at the mass. Speaking at the mass, Ateşyan said it was a historical day for the Armenian Orthodox community since a Greek Orthodox patriarch attended a mass in Akdamar for the first time since its foundation in the 10th century. The annual mass held in the church was the first in 95 years after it was restored and reopened in 2010. Ateşyan said the attendance by the heads of different churches showed that the Orthodox community did not have internal conflict.